From here on it is simply a case of wondering around Rianxo and taking a look at what it has to offer. During our excursion in August, the streets were lined with chairs, tables and parasols from the many bars and any tub or basket that could be planted with flowers was duly filled. All told the town was a great place to wonder round and have a coffee. 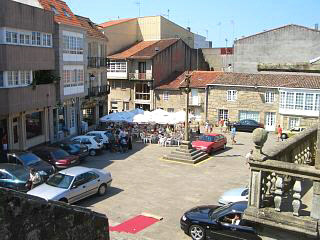 The photo to the left shows one of the small squares in Rianxo as seen from the church that sits above it. The red carpet, which you can see in the bottom of the shot, was there for a wedding that was taking place at the time. In addition to its appealing appearance, Rianxo is also a place of historical interest and has many archaeological treasures including a now famous gold helmet. The churches of "Guadaupe" and "Santa Coloma" are possibly Rianxo's most significant buildings although it also has some "petroglyphs" on mount "Pena" in "Foxa Vella" a short distance away. 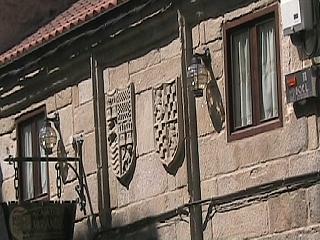 To the right, an old building in the center of town displaying coats of arms. The "Santa Colma" church has curved frontal arch that dates from the 16th century, but the remainder of the building is 15th century. It also has a central "rose" window and some ornate detailing within. The "Guadaupe" church, which is actually a chapel, is primarily 17th century and is named after the "lady of Guadalupe" who has special significance in Rianxo. A further building, of much local significance, is the home of the aforementioned " Daniel Alfonso Rodriguez Castelao", although the only indication of its significance is a subtly placed plaque on the building's facade. Below the home of Rodriguez is the building in center shot. The small plaque can be seen on the buildings left at ground floor level. If you want to sun bathe, the beach of "Tanxil", already mentioned, is in a very protected and sheltered part of the "ria" and the waters that engulf it are calm and lagoon like. The big festival at Easter is regarded as Rianxo's most elaborate and is considered the most colourful in the "Barbanza". Corpus Christi, again featuring a large religious celebration, is another important fiesta in the calendar of Rianxo. 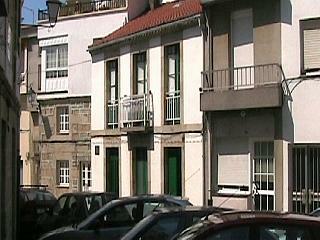 July sees two of Rianxo's main festivities with both its summer fiesta and the "fiesta a Xouba". The latter is a gastronomic festival and the "Xouba" is a fish! 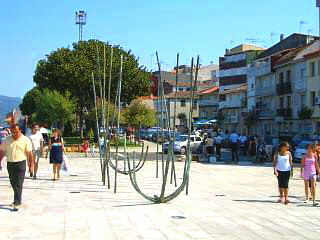 Two further festivals are held in August, one in the district of "Asados" and the other in Rianxo which actually celebrates the traveller or tourist. Rianxo's biggest and most important festival is held on the second Sunday of September every year and celebrates their "lady of Gaudalupe" to whom the local chapel is a shrine. Along with "A Pobra do Caraminal", Rianxo is one of the most attractive and worthwhile towns to visit in the "ria de Arousa". It has all the tourist ingredients of the classic Galician seaside town as well as some local heritage, a genuinely impressive harbour and some great ocean side views of the bay. Left, this final shot is a modern piece of sculpture near the bay and fountains.